Before entering local politics, Bob Smith founded Bike Bakersfield in 2005 because there was no organization focusing on bicycle advocacy in the community. Sometimes, he felt like a lone wolf. Bike Bakersfield provided a home for the advocacy Bob knew was needed to make suburban-oriented Bakersfield more friendly to those traveling on two wheels. In pushing for this redesign, Bob has smartly tried to build on Bakersfield’s existing infrastructure. “What we have now is bike lanes on high-speed arterials, many with speed limits of 45 to 55 miles per hour,” Bob said. From its humble beginnings, Bike Bakersfield has become a leading advocacy organization in Bakersfield, driven by the work of a passionate staff of five. 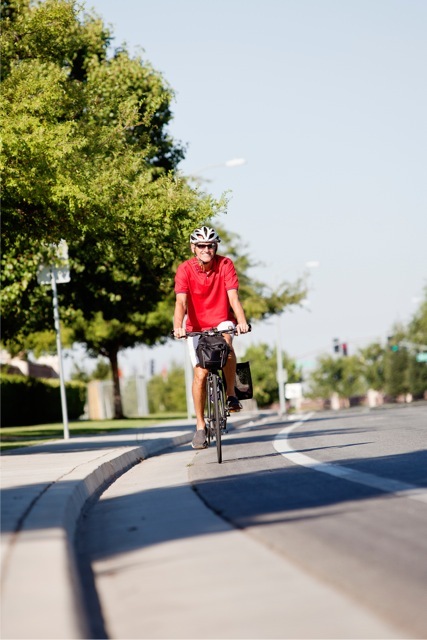 One important service Bike Bakersfield provides is consulting with large employers to help them get their employees to transition from car to bicycle commuting—which can be as simple as helping employees find the best bike route or as technical as providing classes on riding safely in traffic. Bob was elected to the Bakersfield City Council in 2012 and as a Councilmember, helped drive approval of the Bicycle Transportation Plan. “I also got a complete streets resolution approved by Council, so as we repave streets, we add bike lanes from the Bicycle Transportation Plan,” Bob said. Bob is passionate about biking in part because it’s an easy way to work exercise into our overly sedentary daily lives. “I ride my bike every day. It’s not just for health. It’s also stress relief. “It’s fun freedom, every day,” he said.As the bike culture emerges, Bob is seeing significant changes in Bakersfield. “We don’t have the hard data yet, but we’re seeing a lot more people biking in Bakersfield lately. And the more we improve the infrastructure, the more people decide to go by bike,” Bob said.